Change can be exhilarating—and overwhelming. We know that in order to create lasting change, it takes a clear vision, empowered people, and an actionable plan. At Change Catalysts, we have a passion for the work we do and a commitment to the clients we serve. About Barbara A. Trautlein, Ph.D.
Barbara is principal and founder of Change Catalysts, the author of the best-selling book Change Intelligence: Use the Power of CQ to Lead Change that Sticks, and the originator of the CQ® System for Developing Change Intelligence®. For over 25 years, she has coached executives, trained leaders at all levels, certified change agents, and facilitated mission-critical transformations – achieving bottom-line business and powerful leadership results for clients. She is gifted at sharing strategies and tactics that are accessible, actionable, and immediately applicable. 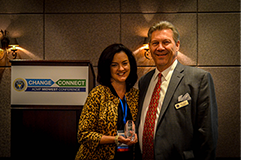 In 2015, Barbara was recognized as the Change Management Consultant of the Year by the Association of Change Management Professionals-Midwest Region. In addition to her “hands on” work with clients, she is a recognized expert, author and researcher on leadership and change management best practices. It is this blend of research and real-world expertise that has made her an in-demand speaker at conferences in North America, South America, Europe, Asia, and Africa. Barbara holds a doctorate in Organizational Psychology from the University of Michigan. Contact Barbara directly at btrautlein@changecatalysts.com.